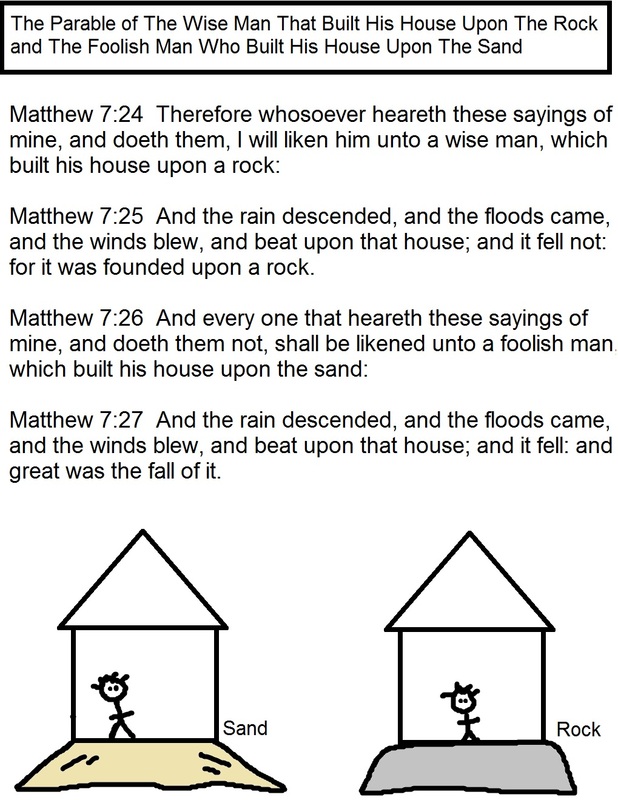 Matthew 7:25 And the rain descended, and the floods came, and the winds blew, and beat upon that house; and it fell not: for it was founded upon a rock. This is an easy object lesson for the kids to watch. Grab yourself two containers. Fill one up with sand and the other with a large rock. Take two small plastic cups and draw two windows and a door on it. Fold a notecard in half and tape on top of cup for the roof. Add a house to the dirt container and one to the rock container. Write on a notecard that says, "The foolish man built his house upon the sand. Matt 7:26-27 on it. Then tape it to the front of the container that is filled with sand. Write on another notecard that says, "The wise man built his house upon the rock. Matt 7:24-25 on it. Then tape it to the front of the container that is filled with the rock. Grab a large pitcher of water and begin to pour it in the container that has sand. I scattered a few small seashells on top of the dirt. As you pour it in this tell the kids how this is representing the things that are coming against a person that is built on sand. When the winds blow and the rain pours it represents the persecutions, tribulations, and trials. They are not founded on Jesus and didn't build their foundation on the word of God so they will not stand. They will be not able to handle the storm when it hits. Now do the same with the house that is on the rock. Pour the water in. Notice how the rock does not move at all. It does not even phase it. The rock is firm and holds in place, because it is sturdy enough to hold the house. Jesus is like the rock. When we are built upon the Lord we will be able to withstand the storm when it hits. We will not be moved. No matter how hard the wind blows or how much it rains the house will not fall. We need to make sure our lives are grounded in God. Make sure you are staying in his word, and talking to him everyday. It's about having a relationship with him. He wants you to be his friend. He wants us to know him one on one. That is what we should be seeking after. A pure heart that will go after him all the way. Even the Bible say's that there will be people that will say they rebuked demons out of people, prophesied in his name, and did mighty works in his name but he will tell them, "Depart from me you workers of iniquity I never knew you." Notice the part where it says I NEVER KNEW YOU. So many people say they know God but they don't talk to him like a friend. God has to know you like you would a friend. It is a close and personal walk with Jesus Christ that makes you a friend of God. I want to be a friend of God. You might want to ask yourself a question. "Do I really know God? Do I really REALLY KNOW HIM? If not then it's NEVER to late to start! He loves you. Print this sheet that has the scripture on it and hand out to the kids. Have the copy the words down on another piece of paper.